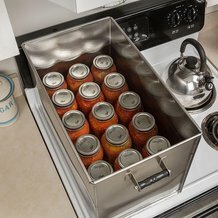 Our stainless steel stovetop water bath canners are handcrafted locally by the Amish and built with large gardens in mind. They are the largest, most durable stainless water bath canners we've found. Perfect for peaches, tomatoes, pears, pickles and more. Why use this product for water bath canning? Visit our reviews below and hear it straight from our customers. Use as a huge stockpot - holds up to 50 qt! Note: Cannot be used on induction burners. Always follow USDA recommendations when canning. Works on woodstoves or gas hotplates. (Keep partly filled when in use). Stainless steel body with wooden handle grips. Extra-strong top edge wrapped around a 1/4" bar of solid stainless steel gives superior strength. Lead-free, silver soldered, "sandwich-locked" seams approved for direct contact with food. 13"H x 20-3/4"L x 11-3/4"W, 13 lb. This item boasts that it can hold 36 pint jars. I purchased it and it holds 23. When I called customer service I was told it would hold 36 if I purchased a second rack. No where does it mention this! Even then logic tells me it would hold 46 pint jars. Where did this 36 come from? Very misleading. Utterly dissatisfied. Lehman's says: Our website mentions: "Holds 15 quart jars or 36 pint jars (with additional shelf#5113 - sold separately)". Also, depending on the shape of your jars, the canner may be able to accommodate a greater number. Our in-house testing has proven that the canner will hold a minimum of 18 traditionally-shaped pint jars PER LAYER. The catalog will be updated to reflect this information as well. We used this water bath as a clam steamer. My wife is from the east coast where theseclam bake/steams are common. It worked very well. We are planning a small neighborhood steam next month. The trial run went well. The only two things that I would improve on is there is no shelf supports for the shelf included and the handles need to be made heavier. My husband bought this for a Christmas present for me. Can't wait to use it. I have a dilema though. Hopefully someone can help. I have use both the water bath and steamer caner. So with this one do you fill it to the top of the jars like a water bath or can you use less water like with a steamer caner? Does any one know? I have used this for three seasons now. 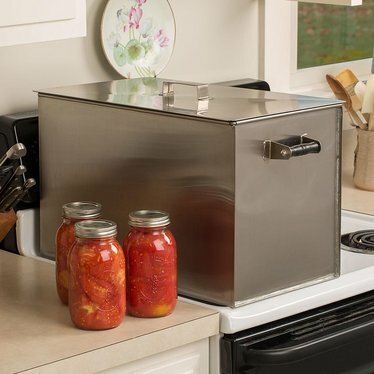 This is a great canner, maybe not the prettiest, but it works very well. My only complaint is that that jars may move and bunch up in a rolling boil. It needs some kind of partition or divider to keep the jars in place. I would gladly pay for this accessory, and then this would be a 5 star product! I bought this canner from Lehman's about ten years ago. I can with it on a smooth ceramic stove top and have had no problems. I've heard people say you shouldn't can on smooth stove top surfaces but that's all I've ever done and have never had any problem at all. As for emptying, I simply use a 2qt. pitcher to dip and fill to empty into the sink. A cinch. I am so happy with mine. It stores easily on top of my upper kitchen cabinets. Why have I waited so long to get this canner!! I know that it is a bit pricey but it saves SO MUCH TIME being able to can 15 quarts at a time! LOVE IT! Maybe I have higher standards of the Amish? But the canner arrived dented, the solder on the seams looks like a child did it, and the wooden handles look they belong on doll house. Oh and maybe the housewives out there are nieve, but how on earth do amish solder? It takes fossil fuels, if not electrify to solder.... Anyways should have been welded. Would have been better built. Great canner! PS. For those people who find the canner too heavy to empty when it's filled-let the water cool, then syphon the canning water to the sink with some plastic tubing from the plumbing section of the hardware store. As long as your sink is lower than the canner, it'll drain quite easily! No more strained backs! I love this thing - definitely makes canning tomatoes a lot faster. It's huge and a pain to store, but worth it. I was worried it would be too heavy for my coil-topped stove, but it has been fine. I definitely would not use this on a smooth-top stove. I purchased this canner almost 20 years ago and use it every year. I've never had any trouble, no leakage, no problems with the handles. I like being able to can a larger quantity at one time. And it holds extra rings & lids & other canning equipment when it's not canning season. I bought this canner 4 years ago and I love it-it was my first purchase from Lehman's, and I was certainly not disappointed. Great product (as usual), Lehman's! We bought this huge stainless steel rectangular canner when we first got married, in 1988. It's terrific! I've canned and made large batches of soup all these years. I love it! It's sturdy, attractive and solidly made. The handles are so pretty. It fits perfectly over two burners of the stove. You can fit 14-15 quarts (plus a layer of pints), or 8 tall half gallon jars (great for canning cider). I agree with all the other glowing reviews. This is a fabulous product. The construction is very well done, the design is perfect in size. It is heavy when it's filled. I love it's simplicity. I can't recommend this product enough. WOW! This thing is THE BOMB! I have cut my canning time in HALF! Very sturdy and well made. I only wish there was a better way to drain it, but it is worth that small inconvenience! We had a couple of Mormon Missionaries come over last evening and when the boy saw this canner he took my Lehman's book with him when he left so he could order one for his mom for Christmas! (she does instruction in food storage for their church, so I'm SURE this will make her VERY, VERY happy as well!) Once again, thank you for making such a great product available and for the super fast shipping too! We purchased two of the Stovetop waterbath canner. They have worked great. Just make sure there is air space between the back of the canner and the stove firewall as it may get very hot and melt the seam or cause the wood handle to burn. Wonderful canner, strongly made and durable. By being able to can 15 quarts at a time, canning volumes of fruit, such as 300 lbs of peaches, seems to take very little time at all. (The only problem can be emptying it--I've got to get my husband to do that as it's too heavy for me when filled with water.) Still, I LOVE this canner!